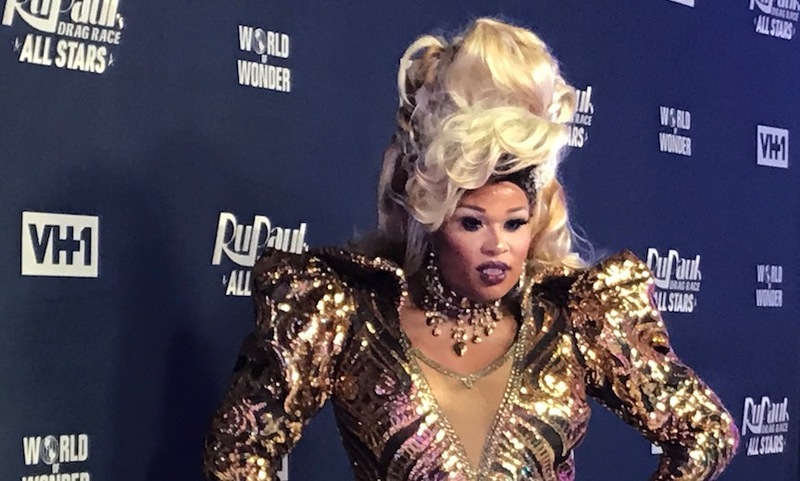 Miss Peppermint at the launch of "RuPaul's Drag Race All Stars 3"
Peppermint is the highest-profile queen to announce a transition, and now RuPaul has recently said he “probably” wouldn’t allow trans contestants on Drag Race … so the stage was set for a showdown. Now Peppermint, who’s headed to the Great White Way later this year as the first trans lead in a Broadway musical (based in part on music by the Go-Go’s) and was a finalist on Season Nine of Drag Race, has a few well-chosen words to address the brewing fracas. She begins her comments with poise and praise for the Emmy Award winner and his show. “Doing Drag Race was one of the best moments of my life. RuPaul kicked open so many doors for queer and gender non-conforming folks and is an absolute trailblazer in the world of drag,” Peppermint says in a public statement first printed by Billboard. The controversy may seem of the moment, but America has grappled with comparable issues before. Before the Civil War, the country’s first entertainment craze was something that’s all but vanished from the world today: minstrelsy. The fad, which was once celebrated at performances in the White House, called for white performers to apply burnt cork to their faces and do coarse and often unflattering impressions of African Americans at their leisure. What’s been lost over the decades is an odd twist on today’s controversy: After emancipation at the end of the Civil War, many newly freed slaves decided that the best way to make money was to head out on the road touring as “a more authentic” version of a minstrel act. Over the next hundred years, many of them became stars in their own right. Now both Ru and Peppermint find themselves delicately navigating a similar minefield, where the precise right answer isn’t readily available. Inclusion means changing what drag has traditionally become famous for: men exaggerating feminine stereotypes for entertainment and self-fulfillment. But… don’t women who were once men, or men who are on a path to becoming women, exist out of the typical barrier of being cis female? Ru has done some damage control, but his first comments have taken on a life of their own, and now it seems the rift between people of good will with common cause is still searching for a way to mend. For the moment, it seems no one is happy.